Combination garden chair and tool bag. 12"x12"
Say hello to relaxed gardening with this 2-in-1 gardening stool and tool bag with fitted tool box. It is lightweight and portable with a sturdy steel frame and tool pockets on the exterior of the storage tote make them readily accessible when sitting in the seat. The storage tote fully detaches from the bag for versatility and ease. We have years of experience working with gardening tools and instruments and we promise user satisfaction. With free shipping over bulk buying, we offer the best deals for quality gardening products. Our prices are extremely economical with a promise of highest quality material and best value for your money. 1 - Combination garden chair and tool bag. 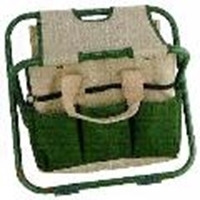 6 - Combination garden chair and tool bag.